SUN HUANG JU Hydraulic Machinery Industrial Co., Ltd. 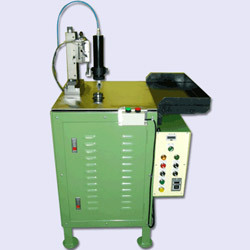 Manufacturer of Rubber Refit Machine Species such as Rubber Trimming Machine. 1. Application: suitable for oil seals non-woven fabrics and wool cloth gluing. 2. Feature: trimming with # 25 collet chuck and the same molds of the collet chuck type trimming machines to low the manufacture cost of molds. 2. Voltage single-phrase: 220V 50/602Hz. 3. Principal axis (R.P.M): 75RPM (none-sect shift). 4. Control mode: electric air pressure cooperated control. 5. Working capacity: 15-25 pcs/min. 6. Glue drop canister: one group, matched hypodermic needle#1~#6. 7. Glue used: silicon LK glueand other agglutinants. 8. Machine size:(L)640 x (W)780 x (H)1200mm. 9. Incasement cubical content:(L)840 x (W)980 x (H)1800mm. 10. Machine weight: (1) Net weight：200kg. (2) Gross weight：280kg.